There are definitely times when they are doing math where they are just sitting there. It seems like they are not doing their work. When I ask what they are doing, I find out they are figuring out a problem in their head. So… they know them, but they don’t really know them! Ya know!? We have lots of flashcards for them to practice their math facts, but they really don’t enjoy doing them. Enter UberSmart Software! 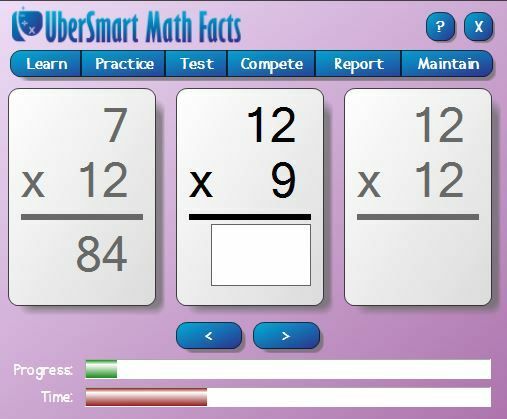 They have given us their UberSmart Math Facts program for us to use in our home so I can review it for all of you! I keep saying ‘math facts’, but what does that really mean? If you know all the basic math facts, then you will be able to work through the bigger math problems much quicker! 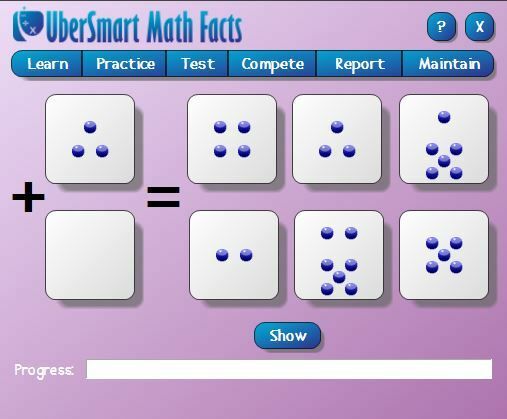 UberSmart Math Facts is a downloadable software for your computer. I want to note that it is for use with Windows 7, 8, XP and Vista only. Sorry Mac guys and gals! The program uses dot cards, as well as numbered flash cards. At first, I didn’t really like the dot cards. I really didn’t see the benefit in using them versus regular numbers. After seeing the kids use them, though, I can see the benefit. As an example, in the flash card above, the program is asking for the answer to 3 + 0. So the child would need to click on the card with 3 dots. Once that card is clicked, it makes a pretty ding sound and puts the word “Correct!” on the screen, then changes to the next flashcard. The program also used the traditional flash cards with numbers. As you can see at the bottom of that picture, the child’s progress on that section and their time are being tracked and the child can see how far they have gone and how much more time is left at any point. I have never really been a big fan of rote memorization. I don’t teach my kids sight words when learning to read and I don’t generally teach them math by using flash cards. Now, once the learning has taken place… meaning they understand why 3 + 4 = 7… I think flash cards are a great way to memorize all those facts. My son (age 10) says he definitely enjoys using this program as opposed to paper flash cards. I like that. It always makes Momma’s life easier when the kids are happy with what they are being asked to do for school!!! What is it? A software program for your computer to help your kids learn/practice their math facts. For Windows 7, 8, XP and Vista only. How much is it? $24.95 for a family license.